The European Union is not plotting to have Cambodia thrown out of the United Nations, despite what one Phnom Penh newspaper recently reported, and what the Cambodian government now believes. A story the Phnom Penh Post published on September 17 reported that a human rights-related resolution the European Parliament adopted four days earlier was threatening sanctions against individual Cambodians and was calling for a review of Cambodia’s involvement in a preferential trade deal. The Post also wrote that the “suspension of its seat at the United Nations” would possibly result from Cambodia ignoring the EU’s “ultimatum”. 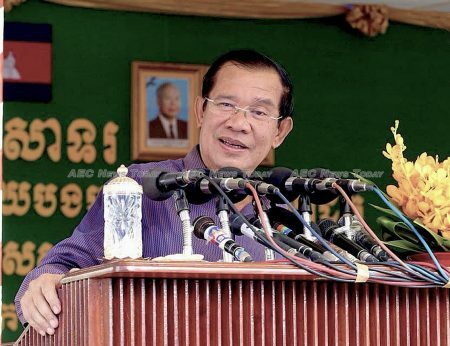 “Who has a big head?” Cambodian Prime Minister Hun Sen asked on Wednesday while announcing an official visit to the UN General Assembly next week. Hun Sen, as reported by the Khmer Times, said in a speech to 27,000 garment workers in Kampong Speu Province that “former opposition members” may have suggested the idea, but apparently gave no further details. What is certain is that on September 13 the European Parliament did not pass a resolution calling for Cambodia’s removal from the UN. The proposal never even came up, according to the motions debated in Strasbourg last week — when the Parliament voted to pursue sanctions against the Kingdom for human rights violations — and also to an official source in the Parliament. 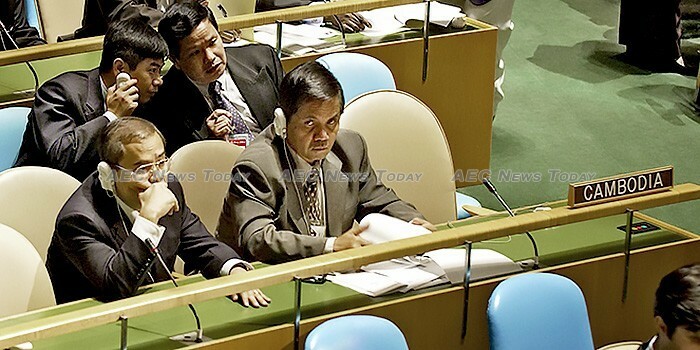 “I don’t remember any reference to stripping Cambodia of its UN seat, which I am not sure how it would even be possible, but feel free to read the resolution yourself”, the source, who was not authorised to comment publicly, told AEC News Today by email. In response to the reported threat Cambodian People’s Party (CPP) spokesman Sok Eysan told the Post that ejecting Cambodia from the General Assembly was both unreasonable and impossible. “It is impossible”, Mr Eysan was quoted as saying. “And if there is a violation of the Paris Agreement, the signatories of the Paris Peace Accords are to convene a meeting with the UN Security Council. There is no mention of suspending Cambodia’s UN seat in the resolution adopted on September 13. Nor in any of its six earlier drafts. Or in the speech Federica Mogherini, the high representative of the European Union for foreign affairs and security policy delivered at a plenary session of the Parliament dealing with breaches of human rights, democracy, and the rule of law in Cambodia. The resolution itself, entitled European Parliament resolution of 13 September 2018 on Cambodia, notably the case of Kem Sokha, only mentions action involving the UN twice. It calls on the Commission and the European External Action Service to “take action and lead the efforts at the forthcoming 39th session of the UN Human Rights Council towards the adoption of a strong resolution addressing the human rights situation in Cambodia”. High Representative Mogherini, while speaking of the situation in Strasbourg, urged Cambodia to review and amend laws used to restrict civil society and opposition movements, adding that if no improvements were made the European Council would “take appropriate actions”, without saying what they might be. However, the resolution itself, after calling for all charges and rulings brought against opposition figures to be dropped, and for restrictions to freedom of speech and assembly to be lifted, provides more detail about possible repercussions. The resolution calls for a list of Cambodian officials who are possible candidates for visa restrictions and asset freezing, and for a review of Cambodia’s participation in the EU’s Generalised Scheme of Preferences (GSP), which confers preferential trade arrangements. Most of the 13 points of the resolution do not contain threats of any kind, but merely outline the Parliament’s concerns for the health of persecuted individuals and for the well-being of Cambodia’s democracy. Although under the UN Charter the UNSC has the power to expel a member from the General Assembly, this has never happened. However, countries can also be suspended from the assembly, which happened to South Africa in 1974 because of its government’s apartheid policies. 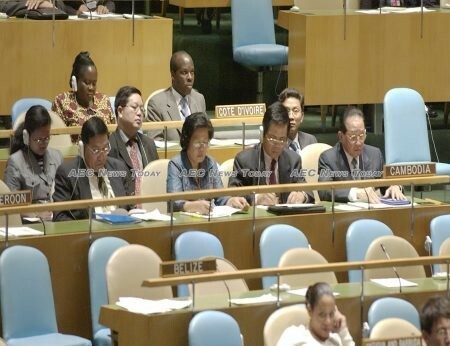 On Wednesday Prime Minister Hun Sen said his visit to the UN on September 27 will involve a speech to the General Assembly, and separate meetings with UN Secretary-General António Guterres and officials from the United States.